This is my ninth solo show at the fringe. I did my first in 1994, met my husband in the audience, had two children, and came back as soon as they were teenagers who could be shipped off to grandparents for the summer. I have been back to Edinburgh since 2011 and love every minute of it! This year I made the finals of the Petfringe Comedian Of The Year Competition, the last nine out of over 800 entrees. I toured New Zealand in March and visited Melbourne Comedy for the first time in April. Bra Trek is a quest for identity and self esteem through the agonized terrain of adolescence…and the search for a bra that fits. It’s stand up storytelling, jokes and truths. It’s for anyone over 14, because though the themes are adult, the journey is one we must all make. I want every human to benefit from the wisdom and jokes of me! i wrote it and perform it, and it was directed by brilliant comedian Jessica Fostekew. It premiered at Leicester Comedy Festival, then went to Auckland New Zealand, visited Dunedin and Wellington, and has been performed at some small UK festivals. Next stop after Edinburgh- Clapham Fringe and Prague Comedy Festival!! Before my show, go and see Caroline Cooke’s Proxy at the Gilded Balloon Turret. It’s early in the morning- 11am but well worth it, a compelling tale about a true and strange horrible psychological event in recent US history. I ALWAYS go and see what new thing Sarah Kendall has come up with. She is my favourite- combining engrossing tense storytelling with brilliant stand-up. 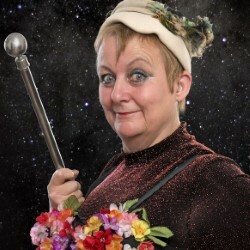 Mandy Knight has a terrific show at the Voodoo Rooms with the PBH Free Fringe. Its going to be a monster.